The Multi-Factor Authentication service is now by-and-large restored, though Microsoft reports that the fixes may take some time to propagate across their global infrastructure. Our own tests, and feedback we have received from the community, indicate that authentications are now working successfully. This entry was posted in ITS, Library, Middlebury Community Interest and tagged Helpdesk Alert on November 19, 2018 by Cynthia Slater. We are experiencing an issue with the Multi-Factor Authentication (MFA) service which is preventing individuals who are off-campus and whose accounts are protected by MFA from accessing services like Office 365, Email, OneDrive, Google G Suite, and Adobe Creative Cloud. We are working with Microsoft to resolve matters as swiftly as possible, but we do not currently have an estimated repair time. We will provide an update as soon as we know more. On Wednesday morning, November 21, the plotter located in Wilson Lab will be moved to the Davis Library public printer room 242. To make room for the plotter, the copier/fax in room 242 is moving downstairs to public printer room 142. The plotter relocation will alleviate the noise and disruption in Wilson Lab caused by the plotter printing. ITS Service Desk student consultants have been trained to perform basic plotter maintenance and troubleshooting. DLINQ interns are still available for application-specific support and training. This entry was posted in Helpdesk Alerts, ITS, Library, LIS Staff Interest, Middlebury Community Interest and tagged Helpdesk Alert on November 16, 2018 by Margaret Fischel. 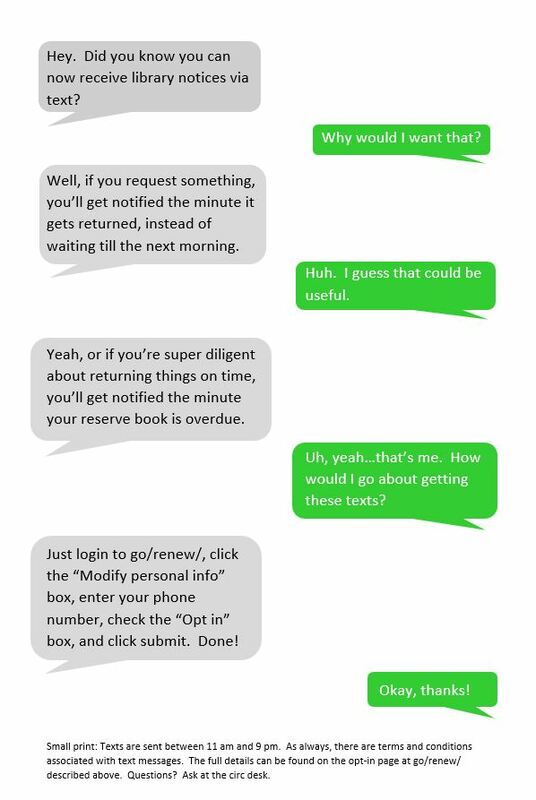 The library now offers patrons the option of receiving circulation notices via text message. 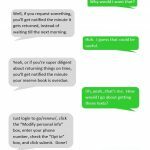 If you choose to opt in, you will get overdue, hold pickup, and courtesy notices on your phone, in addition to via email. To opt in, login to My MIDCAT at go/renew, click the “Modify Personal Info” button, enter your mobile phone number, check the “Opt in” box, read the conditions, and click “Submit”. Opt out at any time by following the same procedure and unchecking the “Opt in” button. Contact library_circulation@middlebury.edu with any questions. This entry was posted in Library, Library News, libspotlight, LIS Staff Interest, middpoints, Post for MiddNotes, Post for MiddPoints and tagged borrowing, circulation, Circulation Services, Library Spotlight, LibrarySpotlight, libspotlight on October 23, 2018 by Dan Frostman. New video tutorial from the Library! 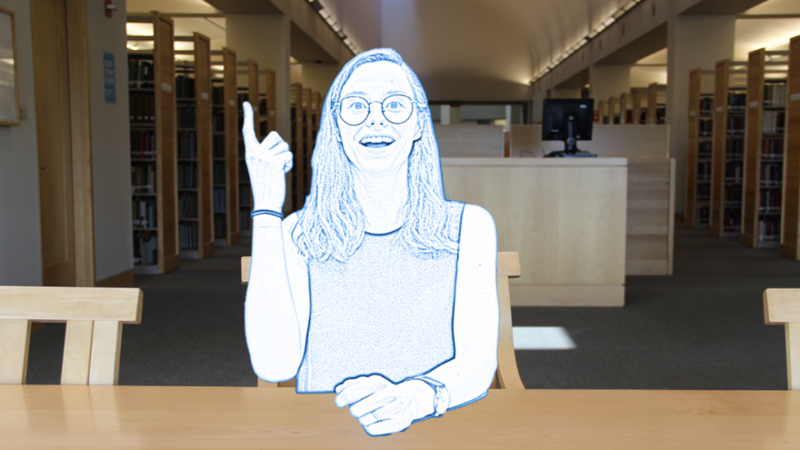 Our newest video tutorial offers students some helpful tips for those moments when they feel stuck in their research, or are just not sure what to do next. There’s no need to struggle in silence! Middlebury College Librarians are here to help with all research problems. Refer students easily with the go link go/TopTips/, or see all of our current video tutorials at go/videotutorials/. This entry was posted in Library, Library News, libspotlight, LIS Staff Interest, Middlebury Community Interest, middpoints, Post for MiddNotes, Post for MiddPoints and tagged Library Spotlight, libspotlight on October 5, 2018 by Amy Frazier. Thanks to all who shared their favorite books from this summer! We had an interactive display in the atrium last week to learn what the Middlebury community read while they were away for the summer. The display may be over, but you can still view the list of titles (below) and how to access them on campus! We will also add some titles that weren’t already in our collection. Thanks for participating! Comment below if your favorite book hasn’t made the list. This entry was posted in Library, Library News, libspotlight, LIS Staff Interest, middpoints, Post for MiddNotes, Post for MiddPoints and tagged Library Display, Library Spotlight on September 24, 2018 by Leanne Galletly. We are experiencing an issue with shared email accounts. Access is denied to individuals or groups who previously had access. We are currently working with impacted individuals to restore permissions as swiftly as possible. We will provide an update as soon as we know more. We apologize for this disruption. Thank you for your patience. This entry was posted in ITS, Library, Middlebury Community Interest and tagged Helpdesk Alert on September 7, 2018 by Cynthia Slater. Starting Tuesday, September 11th, the Circulation Desk in the Davis Family Library will close a half hour before the building closes. There are no changes to the operating hours of the building. A reminder of the change will be made each night before closing on the PA system. This change is only for Davis; Armstrong will not be affected. 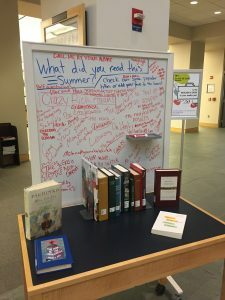 This entry was posted in Library, Library News, libspotlight, LIS Staff Interest, Middlebury Community Interest, middpoints, Post for MiddNotes, Post for MiddPoints and tagged borrowing, circulation, Circulation Services, hours of service on September 4, 2018 by Dan Frostman.